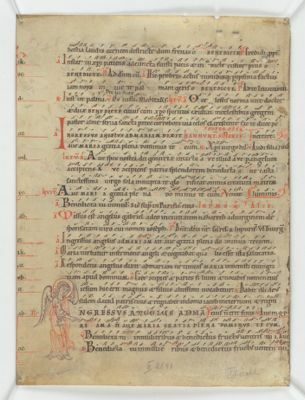 A leaf of the Gottschalk Antiphonal, written and illustrated by Gottschalk of Lambach at and for the use of the Stiftsbibliothek Lambach (Upper Austria) in the late twelfth century. This leaf begins with a portion of the rhymed Benedict office, "Praeclarum late." On the verso of this leaf, the first responsory of Matins for the Feast of the Annunciation begins with a six-line image of the Angel Gabriel representing the letter [I], in red and purple penwork. This leaf sold by B. M. Rosenthal, 1955 to Philip Hofer; his bequest to the Houghton Library, Harvard University, 1984. ...erte ducem clarissimum.../...fructum ventris tui.